It's the post election season in Minnesota. Ah, smell the recount in the air! Given the current lead of Democratic candidate Mark Dayton, a Minnesota Democratic Governorship is a done deal...but hold up...there's more at stake than the actual position. Look for more GOP foot dragging, delaying, and pretending to want 'every vote to count'. This isn't about winning anymore but more about using the situation to further GOP ideology and push through legislation. 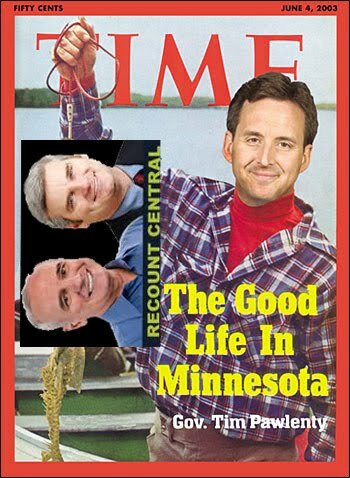 While the recount continues, Tim Pawlenty keeps his role as Minnesota's Governor. With a Republican MN house and senate, partisan GOP legislation can easily pass without the worry of a Democratic Governor Mark Dayton veto. With it virtually statistically impossible for Emmer to win with the current vote gap, the recount and any challenge to it is more about furthering a GOP agenda by passing partisan legislation. "I don't think there's any downside to keeping this recount going on as long as possible, If we keep the process going, there are opportunities for us in the upcoming legislative session." Typically, the Republicans are saying one thing to the media and public while plotting in private. GOP chairman Tony Sutton said on Wednesday that his party has no intention of taking up a lost cause, saying it would pursue only a "credible" court challenge if needed. Yet, Dayton's lead appears to be hold at the upper limit of the margin that would trigger any other recount making it statistically impossible for a GOP legal challenge to change the outcome. Which begs to question, why the GOP would want to delay the inevitable unless it's about passing their personal partisan agenda? However, as every Minnesota House and Senate member is up for re-election in two years, any hijacking of the election to fulfill partisan needs would be seen as a betrayal of Minnesotan voters and could backfire when they go to the polls again. Pawlenty would be the big winner in the recount ... playing the martyr ... while appearing on all the national cable outlets portraying himself as the being above the fray ... it's a great way to stay on the national stage while you shake the moneytree ... and then be able to comment on other national policy issues that otherwise he would be ignored (except for his weekly appearance on FOX). I don't think this will impact the 2012 elections ... 2012 will be bigger then as not only will Pawlenty be battling Obama (yes, Pawlenty is now my odds on favorite to be the Republican nominee) and the Bachmann-Klobuchar Senate race, but all the legislative districts will be redrawn ... candidates will have to introduce themselves to a new set of voters ... nobody will be asking about the Gov-recount. You Can Have This, or You Can Have That! Holy Bat Signal- Eagan,MN Is In Trouble! TPaw 2B The Next US President?